As a past Navy Small Arms Instructor, I'd say the news writer knows nothing about guns except they look bad and she needs to make front page money. So she wrote about a machine gun. 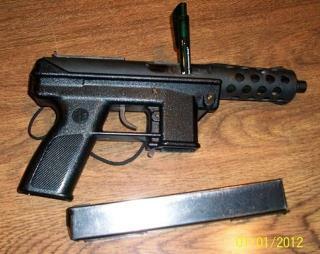 The Tec 9 is a semi-automatic PISTOL ( handgun). A machine gun is a lot bigger and fires FULL-automatic. My concern is that whether or not the police will arrest him for a felony where a gun is involved. I thought guns were illegal in that city - let alone the subway (mass transit). I also wonder if the (assumed) wanne-be gang banger had stolen weapons. Maybe somebody should ask Janet Reno to have a talk with him - We might have another Waco "incident". There is NO CURE for stupid. Caught as a "fare beater" Darn right baby, fly over one of those turnstiles and you will be perp walked and tasered. But it's ok to crash the border and steal benefits from the USA. My word, we can't have a gun in NYC but we can have 11 million criminal Mexicans crashing our economy.